Spring-Loaded pins, sometimes called Spring-Loaded Contacts, Spring probes, or Pogo Pins, provide a highly-reliable, precision made interconnect solution ideal for a number of demanding application requirements in the fast moving world of electronic interconnects. Each Mill-Max spring-loaded pin is precision machined to ensure a high quality, low resistance, compliant connector giving it the edge over other technologies. Mill-Max’s innovative design leads the industry, enabling engineers to specify the right connector for their application. Each Mill-Max spring-loaded pin is typically made of 3 machined components and assembled with an internal spring to provide the range of movement required. 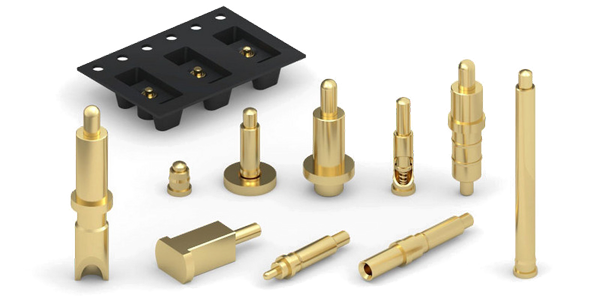 All of these components are electro plated with gold over nickel to ensure excellent electrical conductivity, durability and corrosion protection throughout the life of the product. Thanks to the many advantages spring-loaded pins offer, companies in the telecommunications, military, medical, transportation, aerospace and industrial automation industries have discovered the advantages of using spring-loaded pins in their design. Whether your application requires through-hole mounting, surface mount, wire termination, press-fit or features for alignment, Mill-Max has over 100 styles to choose from to ensure you find the right spring-loaded pin for your design.